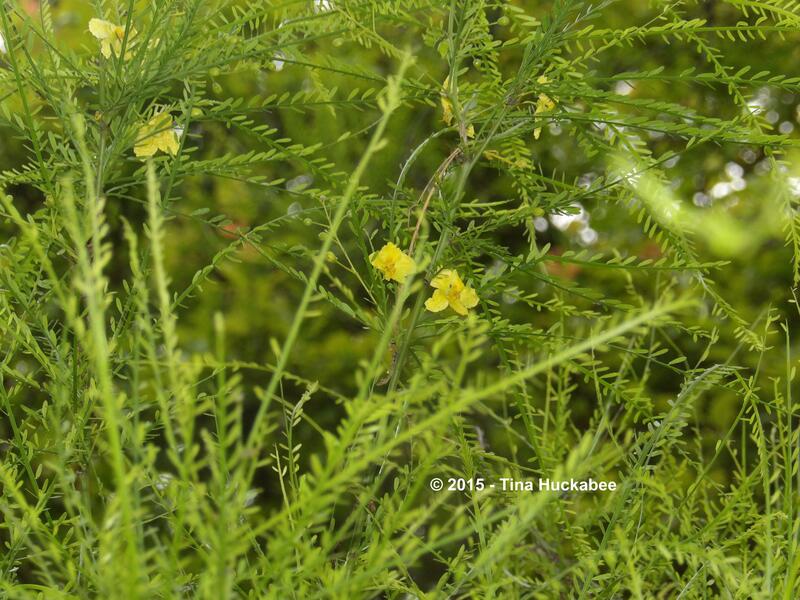 Charming and cheery are the flowers of the Retama, Parkinsonia aculeata, during the warm season and they showed their yellow selves on my tree in May. 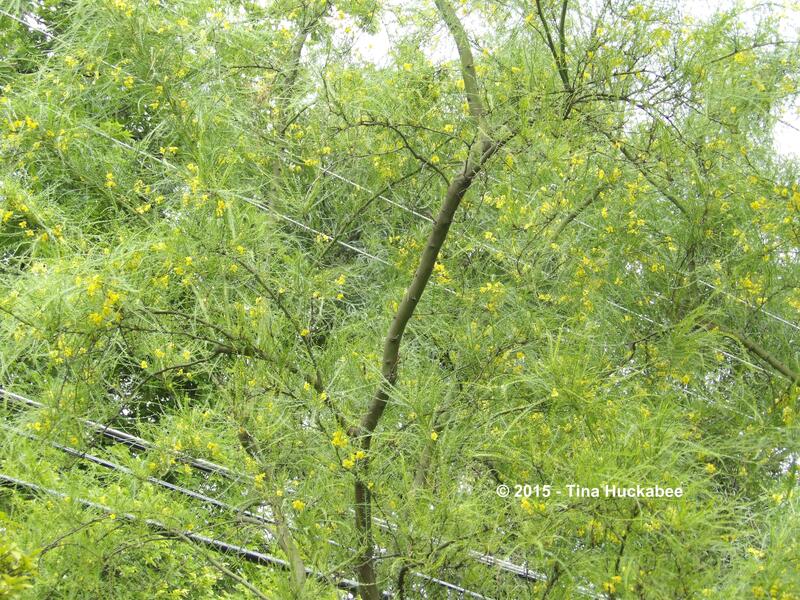 Thanking Lucy at Loose and Leafy for Tree Following and for June’s edition, it’s May flowers all around for my Retama. In glorious profusion, amidst feathery foliage, the flowers have brightened our very wet and dreary May. The flowers are many toward the top of my tree, far above my reach and there’s always a puff of wind when I’m trying to snap a photo. 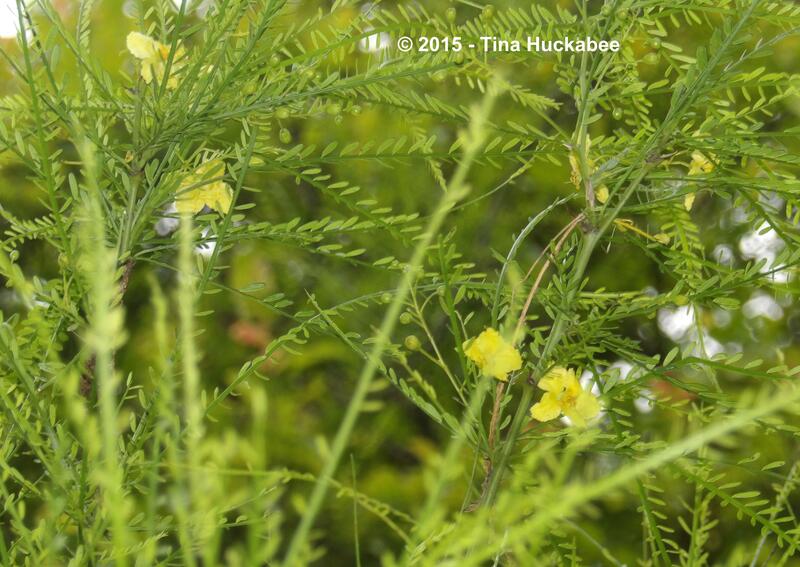 Though these photos are less than crystal clear, Retama blooms are interesting. Sunshine yellow , these flowers develop in clusters and each consists of five turned back petals. In the center of each bloom is a group of green stamens, 10 is what the literature claims, but honestly I’ve never counted. One petal, the “top” one, is slightly larger than the others and turns red/orange as the bloom ages and begins to wither. According to the Lady Bird Johnson Wildflower Center this petal has a “honey” gland which is what causes the color change. These photos are the best I could muster given our many days of heavy rain, some traveling away from home, and photographic frustration. You can click on this link for an excellent close-up shot of this pretty and unusual flower. Actually, I like this photo of two blooms that were knocked off of the tree by one of the heavy rain events of this past month. They share space with an acorn and the leaves and red, spent bloom of a Tropical Sage, Salvia coccinea. 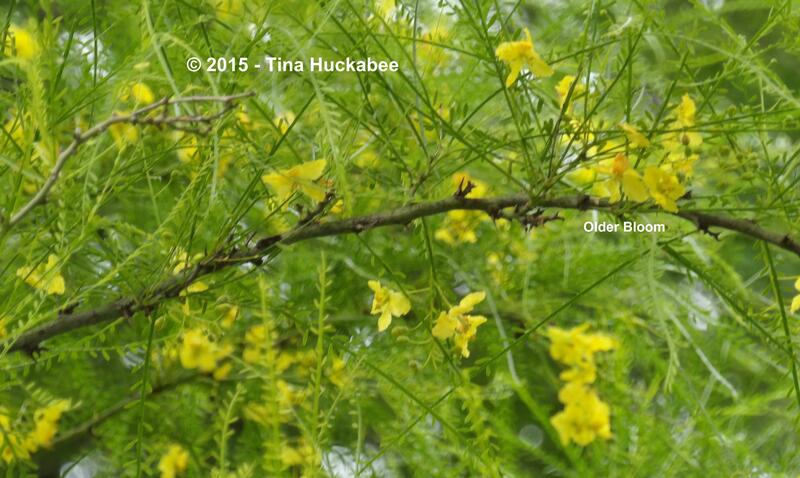 The floriferous tree is welcome in my May-June garden and I enjoy it for its beauty. 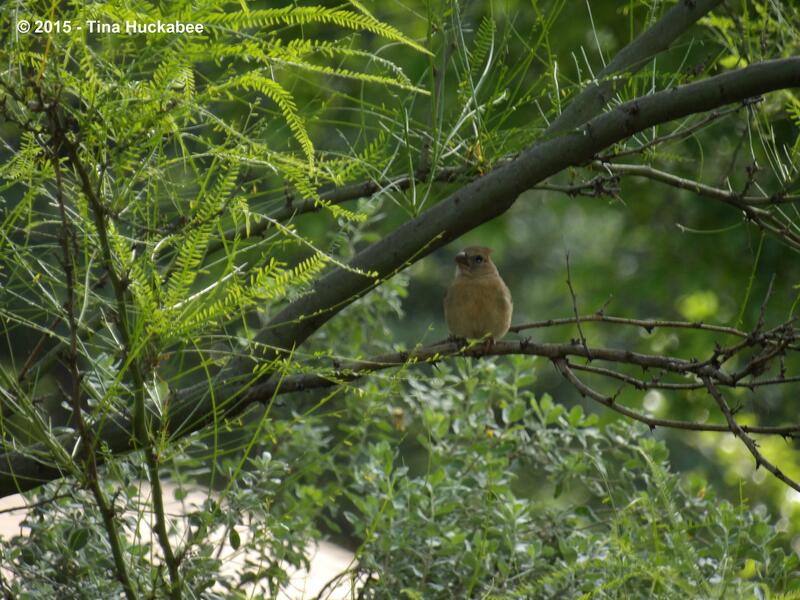 But more important than its being another pretty face, Retama is considered an excellent wildlife plant. Of course I never had my camera handy when I observed, but I’ve seen honeybees, native bees, some butterflies, and a hummingbird feeding at the flowers this past month. As with other parts of the Retama, scientific research supports the important role that the flowers play in traditional medicine. The flowers are dried then applied as a poultice for the treatment for rheumatism. 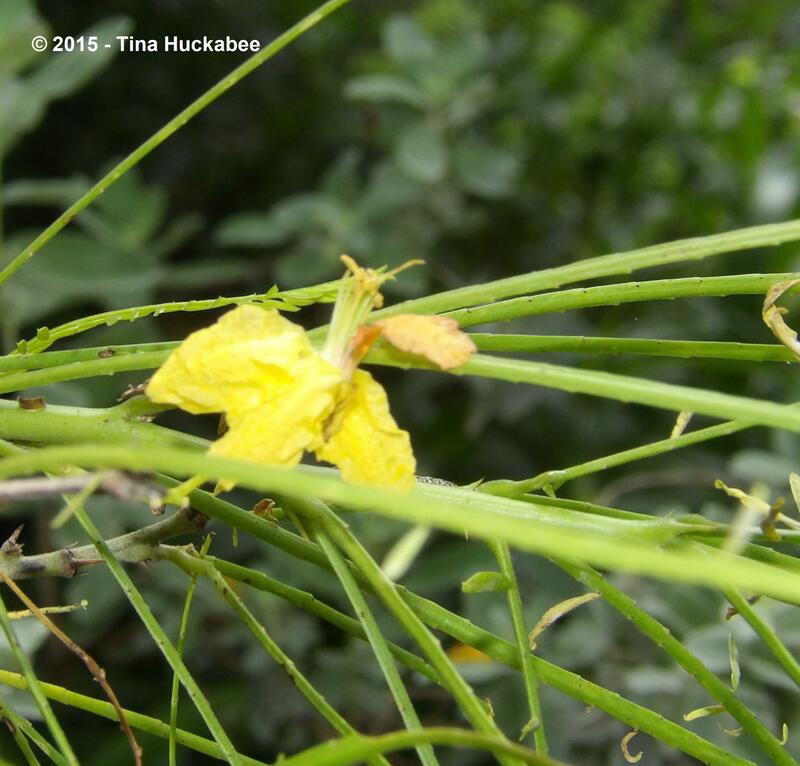 Along with the leaves, the blooms also possess antidiabetic and antimalarial qualities. Interestingly, I would say that my Retama isn’t blooming as well as I’ve seen in past years. 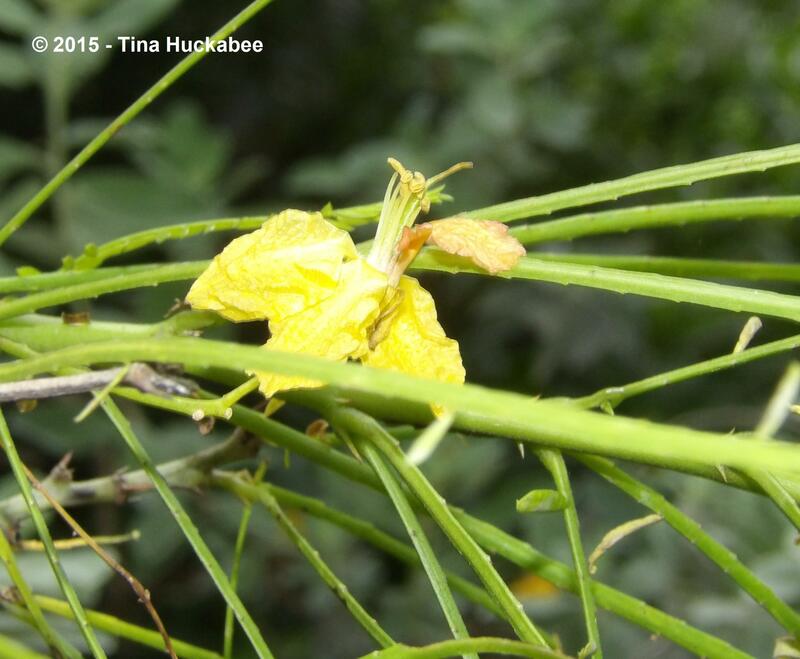 Yes, the flowers are lovely, but I’ve seen it bloom solid, almost blindingly yellow in other years. Like many native-to-Texas plants, Retama likes water, thank you very much, but too much water, is…too much. Austin received over 17 inches of rain in May (our normal rainfall for May is about 4 inches), and the flooding has hampered some native plants’ bloom production–at least in my gardens. 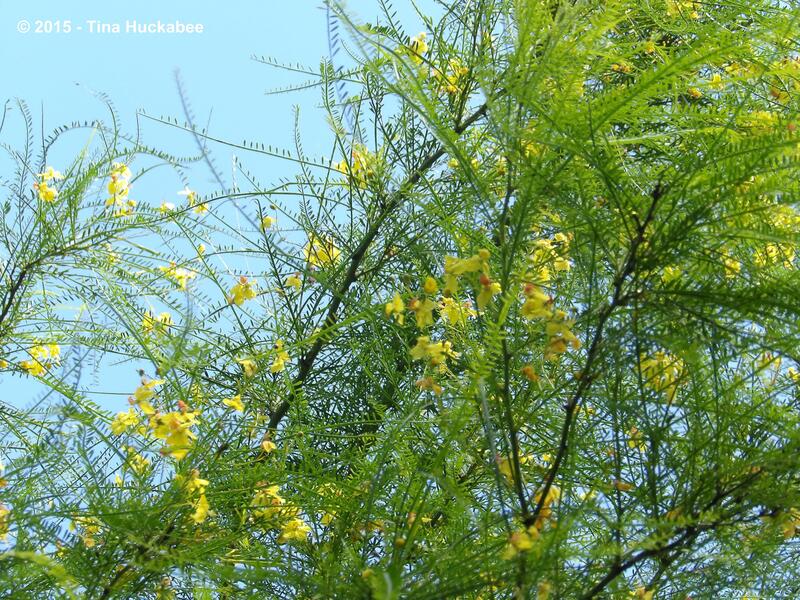 Many native Texas plants grow and flower better in “normal” conditions, or even slightly dryer-than-normal conditions. The Retama isn’t harmed by the rain, but I suspect it won’t have a banner blooming year. No matter. It’s still gorgeous. And the flowers are welcome–to me and to the myriad critters who enjoy what the tree offers: foliage, bark, and blooms. Check out Loose and Leafy for other June arboreal action. 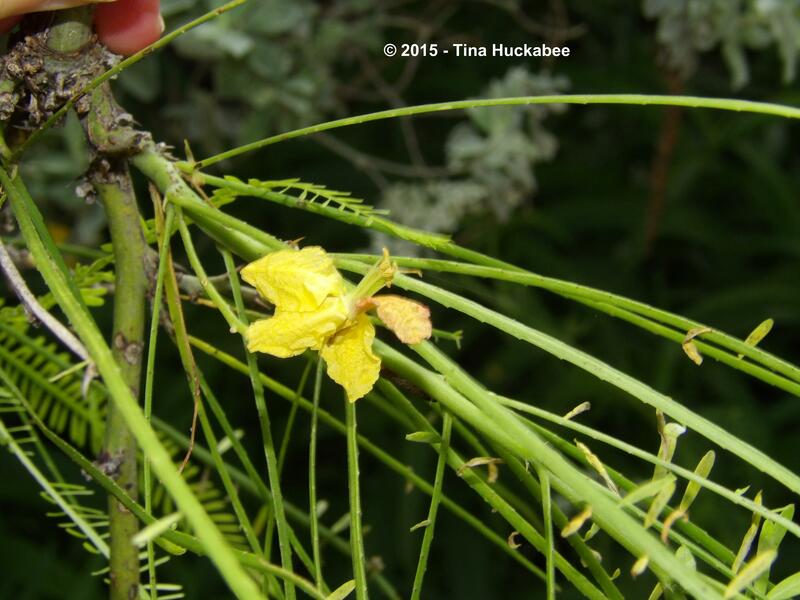 This entry was posted in Tree Following and tagged Parkinsonia aculeata, Retama by Tina. Bookmark the permalink. Thank you, Lea! And you as well. That yellow with that green is kind of a perfect match. Gentle and pretty. Gentle and pretty–that just about sums it up, doesn’t it? That last photo is especially adorable. I often joke that if the day is super still all that is needed to generate a breeze is for me to take my camera outside and focus on…anything. And that retama is drop dead gorgeous. I’m keeping an eye out for a spot to open up here for one. If we do get a sunny opening for a tree, retama tops the list! I too am noticing some native plants seem to be a little less than thrilled with the extra watering they got this May. I am totally unused to watering now, spoiled rotten, and have to keep reminding myself that container plants will need a bit of occasional attention now it isn’t raining every day. The wind is definitely not a friend to the photographer, that’s for sure. I love my retama. For what it’s worth, mine doesn’t really get “full” sun. It would bloom more and better if it did, but even with part sun, I still get a good showing of blooms and the foliage is always lovely. The nice thing too, is that it doesn’t have an umbrella spread of its limbs; it grows upwardly to reach what sun it can. Maybe that helps in finding a spot? Additionally, BSN will most probably have them on sale as summer wears on; I think I paid $6 for mine. Not bad. I’ve always noticed that the many natives put on lots of foliage growth, but less in blooms when we have a rainy season. I tend to prune more, to keep the limbs in check. The pavonia, turk’s cap, autumn sage–they’re all blooming less right now than they should. You’re right about having to get in gear for container plant watering–we were spoiled at the rains and now, must step up our watering game, or will suffer the consequences. Or, rather, our plants will. What a wonderful tree, I’d not heard of it before. Love the foliage and flowers. Thank you, Alison. The Retama is a great tree for my region. What a beautiful tree to have your your garden Tina, great to hear too thats its so good for wildlife, that must make standing nearby a real treat. Yes, though the bees and butterflies are waaay up in the tree and the darned birds fly away. Sitting across the back garden with a set of binoculars seems to be the ticket. Thanks for stopping in, Frances! The Retama is native to this part of the world–Texas, the southwestern part of the U.S. and southwards into Mexico and parts of South America. It’s a fabulous tree–I’m glad it’s in my garden and that I chose to follow it for this year. Texas has been in a severe drought, but most parts of the state received lots of rain in May. Technically, we’re out of drought–for the moment, though certainly, if the rainfall doesn’t continue through the summer months and onward, we will be considered in a drought situation. Truthfully, I rather like it when we’re in a “moderate drought”–my plants tend to perform better and cities and municipalities implement watering restrictions, which I think is a good thing. 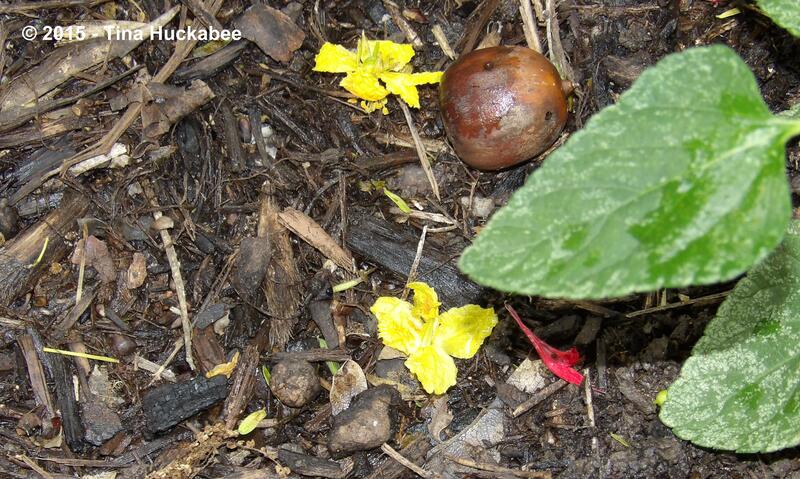 It’s tough to lose plants,for whatever reason–too much rain or not enough. Wishing you a dryer June as well. 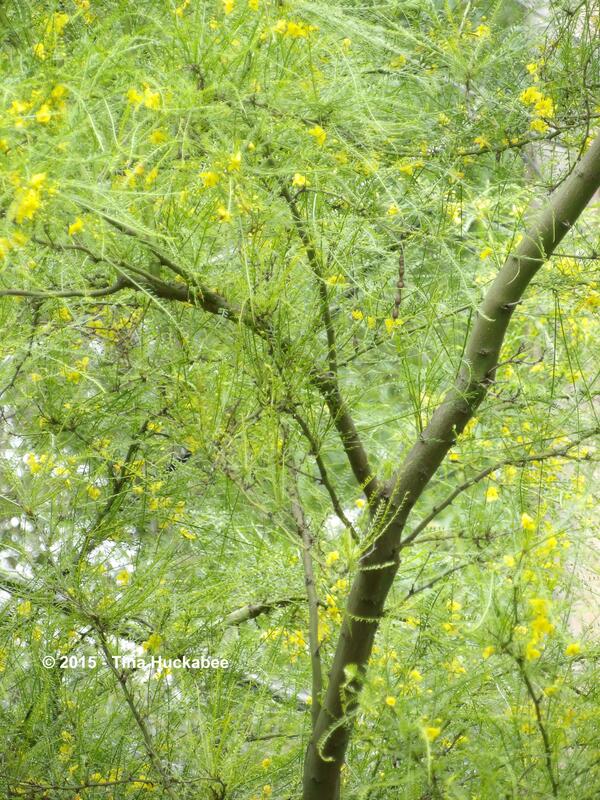 What wildlife could resist this tree and its stunning green bark and yellow flowers….even more beautiful in person I think! Yes, there are always birds-n-bees-n-other stuff around this tree. It’s a beautiful tree, not just mine, but those along the roads and highways! Yes, it is a legume! Though I hadn’t really thought about it, the flower is pea like in shape and petal formation. Those leaves are pretty great, aren’t they? Very unique and charming plant. Love the texture. It is charming. I haven’t thought of that to describe Retama, but it’s a good choice of word! Your Retama is exquisite. It’s amazing what too much rain can do, isn’t it? We were flooding just a couple of weeks ago, and now the ground is already dry and cracking in places. It has really taken it’s toll on the plants and wildlife. Thanks! It’s a pretty one, isn’t it? Funnily enough, there was so much rain, that all of the blooms have dropped off! It’ll be interesting to see whether it blooms up again, or not. Either way, the foliage is pretty. 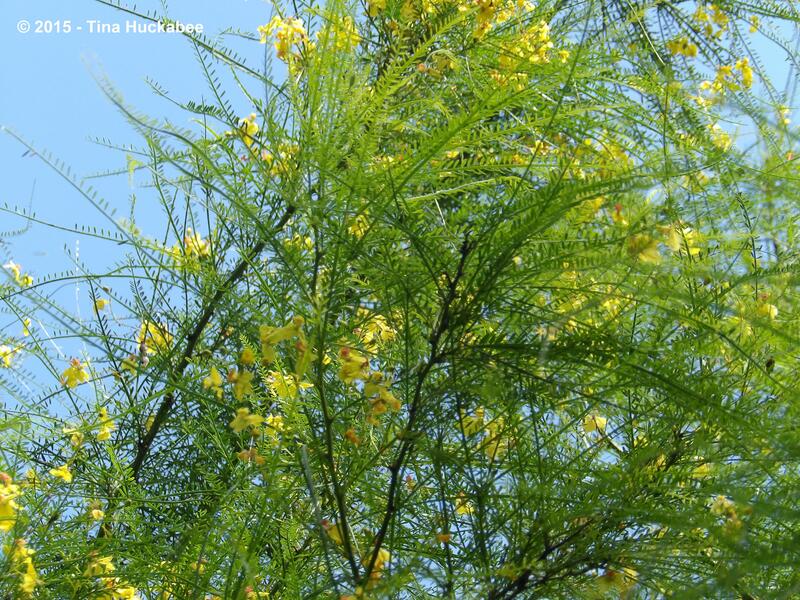 A gorgeous tree, the yellow blooms against a blue sky are wonderful. That’s a beautiful combo, I agree. I just love the feathery foliage against the clear, blue sky. It really is a great tree to have! – if your climate allows 🙂 The particular, fine textured foliage is something that we (in a colder climate) miss having in a tree (there are shrubs). And so useful for the wildlife, many, many qualities! Retama is definitely a warm-climate plant, no doubt. It’s foliage is so pretty. I’ve enjoyed learning more about it with this Tree Following business. Actually, that banner is a about a year old–the banners randomly rotate. The honeybees love that blue birdbath, though they do visit my other ones too. I guess it’s the color? Anyway, thanks–they are fun to watch. Apologies for being late in reading this post. I too have been away a lot recently. 17 inches does sound a lot of rain. This beautiful tree is quite distinct from the other trees we are following. So glad this was your choice. NO worries, Lucy–I hope that blogging isn’t your whole life! 🙂 I’m glad I picked the Retama, too–I’ve learned so much by participating in Tree Following. Thank you!